Dark energy has the cosmoslogists scratching their heads. Observations taken by NASA’s Hubble Space Telescope and future space telescopes will be needed in order to determine the properties of dark energy, which makes up about 70 percent of the universe. 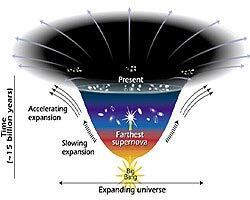 Probing dark energy, the energy in empty space causing the expanding universe to accelerate, calls for accurately measuring how that expansion rate is increasing with time. Dark energy is thought to drive space apart. Astronomers theorize that the faster expansion rate is due to a mysterious, dark force that is pulling galaxies apart. Astronomers used NASA’s Hubble Space Telescope to hunt for supernovae (an energetic explosive event that occurs at the end of a star’s lifetime), using their brightness, astronomers could measure if the universe was expanding faster or slower in the distant past. In its search, Hubble discovered 42 new supernovae, including six that are among the most distant ever found. The farthest supernovae show that the universe was decelerating long ago, but then “changed gears” and began to accelerate. Albert Einstein coined the term “cosmological constant” to represent the possibility that even empty space has energy and couples to gravity. Like other astronomers of the time, he thought that the universe was static and so proposed there was a repulsive force from space that kept the universe in balance. Einstein discarded his own findings in 1929, when Edwin Hubble found through his research that the universe was expanding and not static. Today, new data from Hubble may well prove Einstein was on the right track. The pull of gravity and the push of dark energy have been trying to outmuscle each other since the beginning of time. About seven billion years ago, dark energy got the upper hand because the universe had grown so large and matter (the source of gravity) had expanded and scattered. 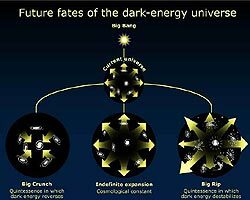 Unstable dark energy could cause a “big rip” (the universe expands violently, then the stars, planets and atoms come unglued) or a “big crunch” (the universe implodes or compresses). Cosmologists believe about 70 percent of the universe consists of dark energy, 25 percent is dark matter, and only four percent normal matter (the stuff that stars, planets and people are made of). Hubble observations suggest the dark energy may be Einstein’s cosmological constant, an energy percolating out of the vacuum of the space between galaxies. The energy of the universe is dominated by empty space emitting a repulsive form of gravity that is pushing the universe apart. But what does all this mean to Earth? Even if Einstein’s theory was correct, we won’t have to be concerned about the “dark side” for about 30 billion years, according to Hubble researchers. This entry was posted in Energy, Universe. Bookmark the permalink.